Did you ever see the Nightmare Before Christmas movie? Well, I hadn’t. My dear friend’s son wants a red velvet birthday cake with that theme. He’d loan me a DVD so I could watch the movie. Great! But before I could get the movie, I got on the internet to see what this was about. This was going to be tricky, but fun! After seeing the movie I didn’t have any better plan than before. It’s a dark movie… meaning all the colors are dark. I would have to brighten it up and somehow make it cheerier than the movie. I thought I would create a Halloween Town, simplify the details some, but give an overall feeling. 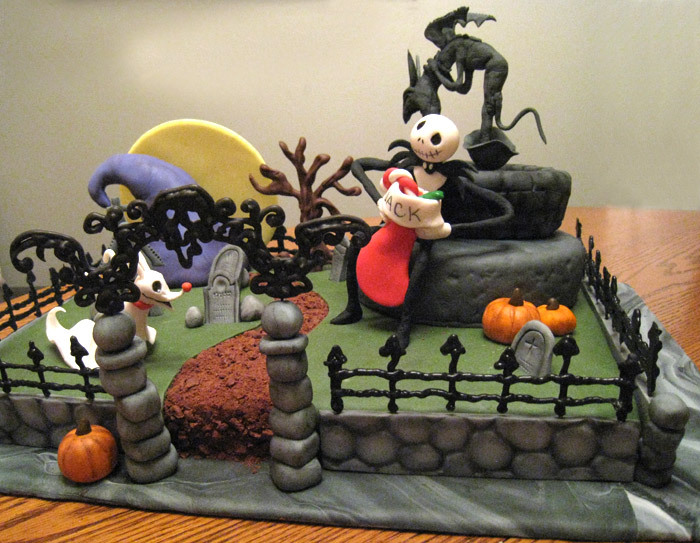 Elements to the cake would be Jack Skellington and Zero the ghost dog, the town fountain, graveyard, the famous purple hill and moon. Jack Skellington sitting on the town square fountain. I began with the fountain, everything else would work off of that. For reference I found a photo of the fountain statue online and started to build a wire armature for this. It would need to be sturdy enough to stand on its own. Luckily, because of the aged look of the fountain, it could be a little rough. Once that was finished, I made the cereal-treat fountain the statue would stand in. I figured I’d put in on a six-inch round cake and Jack could sit there. 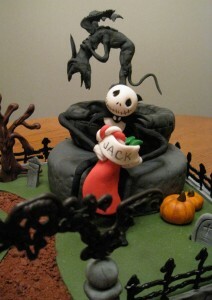 Another thing about this theme is that Jack is sooo skinny! I couldn’t make much of an armature or he’d be too big. Maybe just stainless steel wire. I’ll make him sitting, that way other items on the cake would make sense. The head needed to be dry, so I made that first. Then I covered the frame in black gum paste. The rest of Jack I would do in a couple of days. I didn’t really need a large cake, but to make this work I needed a small sheet cake for the base. I was thinking that if I made the graveyard across from Jack, I could put a path of crushed chocolate Teddy Grahams between them, that led to the purple mountain. 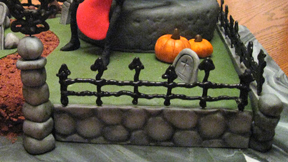 Stamped fondant rock wall with piped chocolate fence on top surrounds Halloween Town. 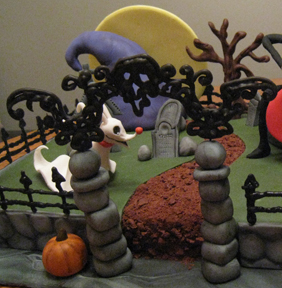 I wanted to make a spooky chocolate fence around the graveyard but then decided to encircle the whole cake with it. To tie-in the colors and feel of the old fountain, I made the lower part of the wall with thick slabs of fondant stamped with a rock pattern and detailed with dusting powder. For the top of the fence, I drew out a fence pattern. I cut small pieces of wire that would re-enforce the ends of the fence and would later stick in the top of the walls. I put the pattern under wax paper and taped it to the counter. Then laid the wire on each end and in at least two more places along the fence. I colored chocolate Candy Melts black and piped over the pattern, wires and all. Then let them cool. Chocolate skull-topped gateway to Halloween Town. I used that same technique on the skull design over the gate. I had to make a few of them to figure out just how thick they needed to be to withstand the handling. Again, wires would hold it in the top of the rock columns. The purple mountain was made of cereal treats and purple fondant. I just had to be careful to balance it right. The moon was just a disk of yellow gum paste, I cut out and let set it aside to dry. I made gum paste and fondant details; a christmas stocking for Jack, assorted pumpkins, headstones, rocks for the corners and entry gate posts extra for the graveyard and a chocolate skeletal tree for the background. Zero the ghost dog took a little time. I made two of them because that tail wanted to break off! Time to assemble the cake! I used black and white fondant and a marbling effect to cover the board. Then set the sheet cake down and covered it with green fondant. I cut out the pathway and put the crushed cookies down. Using a mixture of water and fondant to make a glue, I put the rock walls up next. I covered the small cake with grey fondant and scored a stone design in it. Then set it in the upper right corner. The fountain went on next and the purple mountain after. The rocks, pumpkins, and Zero could go on now too. Everything else I packed up carefully and transported with the cake to the party. I had to have the birthday boy go to his room. It’s a small house and I wanted to surprise him with the cake. I finished setting it up on the table by adding the fence, gate topper, tree, yellow moon and set Jack Skellington on the fountain. Then I called Joe out… He absolutely loved it! I had to convince him to cut the cake so we could have some. He really didn’t want to but then he finally consented to cutting up the small one under the fountain. Luckily it was a small gathering! Jack Skellington’s world of Halloween Town. Note: To this day, 1 1/2 years later, Jack is still sitting on the fountain. But now it’s on top of the refrigerator.